Onward! Onward! How far will we get this time? Coaldale, as seen in August, 2010. With Boundary Peak still in view, MOH and I rounded the corner at Coaldale Junction, and pulled in briefly at Coaldale. 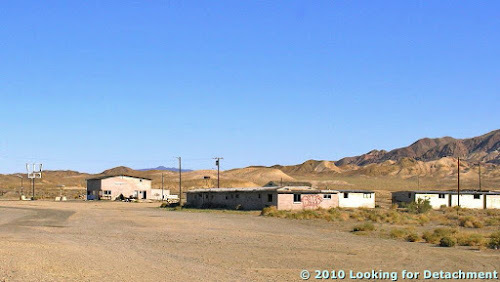 This particular ghost town, which was first a small mining town and later a roadside waystation with a tiny population, holds a few minor memories for me, dating back to my early days at Northern Exploration Company in the late 70s and early 80s. For some reason, it always seems like a depressing place to stop, and I can rarely bring myself to take a photograph or to get out of my vehicle to take a close look. This time was no different, so I've uploaded a photo I shot back in 2010. A few miles on, we pulled in at Black Rock, a spot which may originally have been just a little prospect pit in some black chert of the Ordovician Palmetto Formation, but which is now a semi-convenient place to stretch your legs (although it doesn't really offer much cover as a pit stop, and the Millers rest area and the town of Tonopah aren't too much farther down the road). 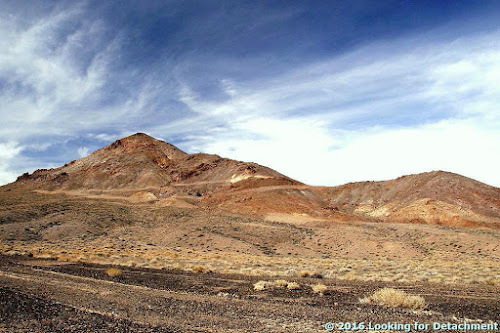 Coming to Black Rock from the west, Google Street View. Lone Mountain as seen from Black Rock, looking ESE. 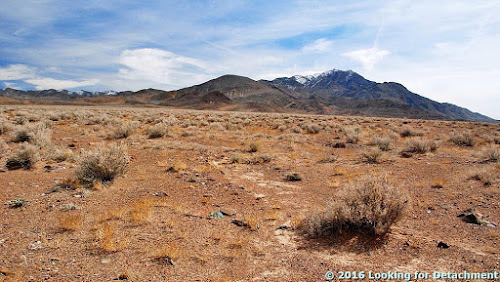 From the south side of Black Rock, we had a good view of Lone Mountain beyond the playa and salt flat of the southwestern end of Big Smoky Valley. A tiny bit of the Weepah Hills is in shadow off to the right (west). 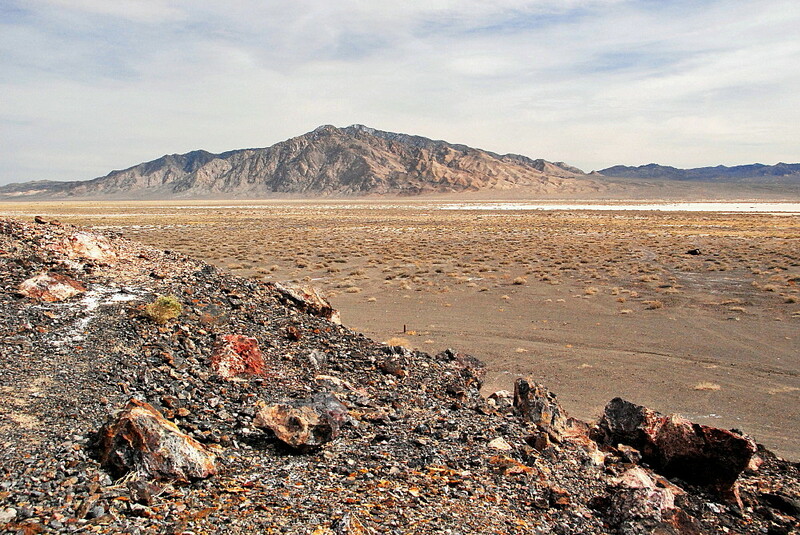 A closer view of the southwest to northwest side of Lone Mountain. In this photo, the lighter colored rock formation toward the right (west) is the ЄpЄ Reed Dolomite, which, as I noted earlier, is usually listed as Precambrian or Precambrian to Cambrian, and sometimes as Cambrian only. 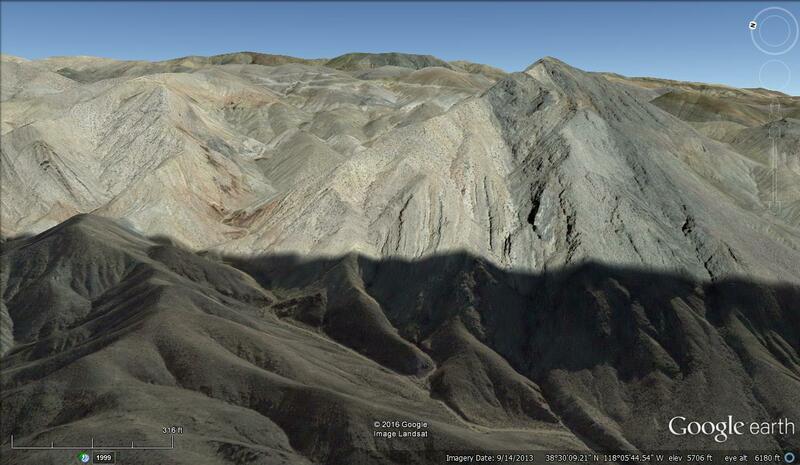 Here it's on top of a thin, dark section of Precambrian Wyman Formation. Underneath the Wyman, and to the left (east), the Cretaceous Lone Mountain pluton forms the bulk of Lone Mountain. A couple ways in which the Cretaceous may have intruded the Precambrian so sharply and neatly are developed by Maldonado (1984) in the explanation of his map of the Lone Mountain area. I personally think the contact is structural: a low-angle fault (detachment, anyone? 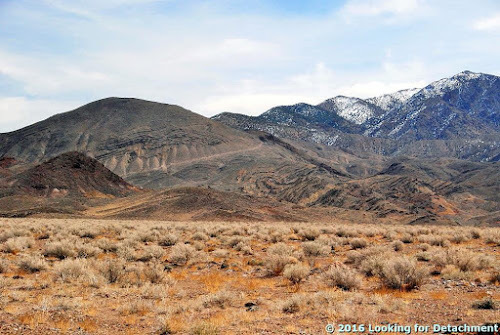 ), and, in fact, the area is noted as being part of the Silver Peak-Lone Mountain detachment system (Oldow et al, 1994) or Silver Peak-Lone Mountain extensional (or core) complex (Oldow et al, 2009). Also, this map shows the contact as a detachment fault (Hulen, 2008, between pages 4 and 5). 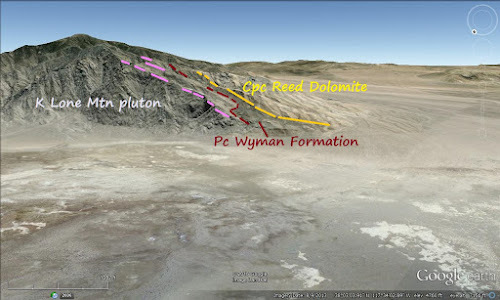 In the few places that I've seen the Wyman-pluton contact on Lone Mountain, I've noted shearing, faulting, or other complexities—and along the north and west side of Lone Mountain, the top of the pluton looks somewhat planar from a distance, and other planar features (jointing?) are apparent from some angles. 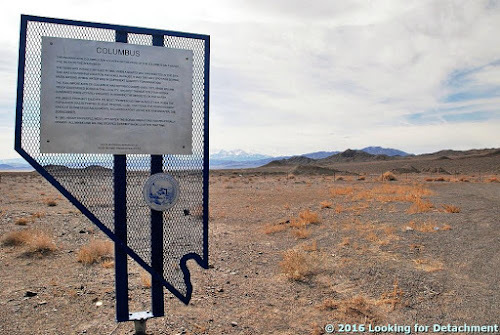 If you're driving by, a good place to pull off to see these planar features (I'm really not sure what they are) is at the turnoff to the dirt road going to the northern Gilbert mining district a few miles east of Black Rock (Google Maps location). Google Earth image from the perspective of between Black Rock and the turnoff to the northern Gilbert district, and up in the air a bit. Approximate mapped contacts of the three major rock formations, from Maldonado, 1984. The same image with a few pink lines added. I'm not sure what the pink lines represent, other than that they are supposedly entirely within the Lone Mountain pluton. They may be joints in the pluton; they may be Tertiary lamprophyre dikes, as on the 1984 map. Another possibility is that the intrusive-sedimentary contact is mixed, like it is on Mineral Ridge, where Wyman and intrusive rock alternate near or just below the detachment fault (or detachment faults). Or maybe all three possibilities come into play. 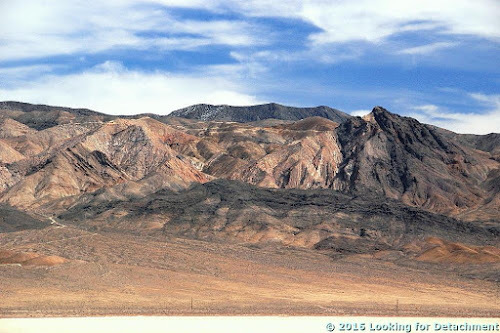 These are just a few ideas to take with you if you happen to go hiking in the area. Turning back toward the highway, I stumbled across a few interesting rocks. The rock is a veined and brecciated chunk of Ordovician Palmetto Formation—chert or siliceous mudstone to siltstone. While walking around, I wondered what the remnant of an old mine dump was all about. Maybe this rock holds a clue. Here's a zoomed in view of the same rock, focusing in on the quartz vein right and center. The quartz vein contains brown blades of a relict mineral that has now gone to iron-oxide and silica. Possibly the mineral was calcite, and if so, the resulting mineral or texture is often referred to as "bladed quartz" or "bladed quartz after calcite," or more properly, "quartz [or silica] after bladed calcite." The texture can be indicative that you're in the right part of an epithermal system to find an economic gold or silver deposit. Most of the quartz after calcite I've seen has been crystalline; this silica is microcrystalline. In fact, several smallish gold deposits have been found in the immediate area, and one has been mined (so far only one deposit has been considered economic). The Boss mine, a small gold deposit mined in the late 1980s, can be seen just across the road from Black Rock. A zoomed-in view of the open pit area of the Boss mine. The Boss produced about 32,000 ounces of gold from 600,000 tons of ore (Diner and Strachan, 1994). That would mean the ore grade was about 0.053 ounces Au per ton (o.p.t). The other deposits, including the Black Rock zone, are described here and here, along with the geology of the Boss mining area. 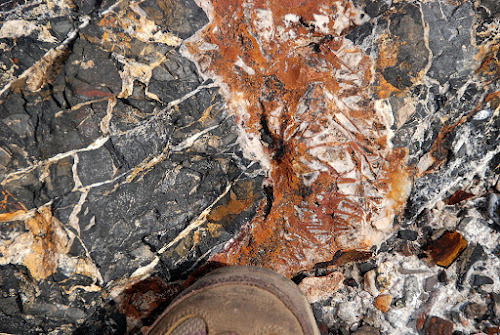 Gold is reported to occur mostly in both Tertiary rhyolites and andesites. And that will be it for today! 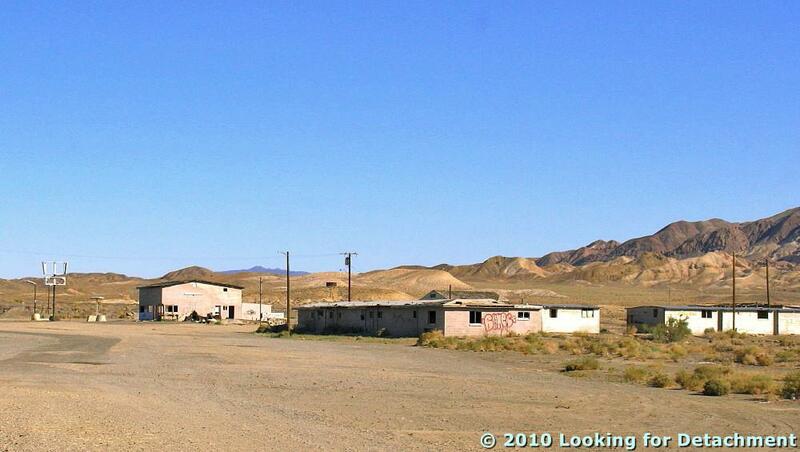 Diner, Y., and Strachan, D.G., 1994, Geology of the Boss mining area, Gilbert district, Esmeralda County, Nevada: Econ. Geology v. 89, no. 5, p. 1176-1182. Hulen, J.B., 2008, Geology and conceptual modeling of the Silver Peak geothermal prospect, Esmeralda County, Nevada: unpublished report for Sierra Geothermal Power Corporation, 23 p.
Maldonado, Florian, 1984, Bedrock geologic map of the Lone Mountain pluton area, Esmeralda County, Nevada: U.S. Geological Survey Map I-1533, 1:24,000. 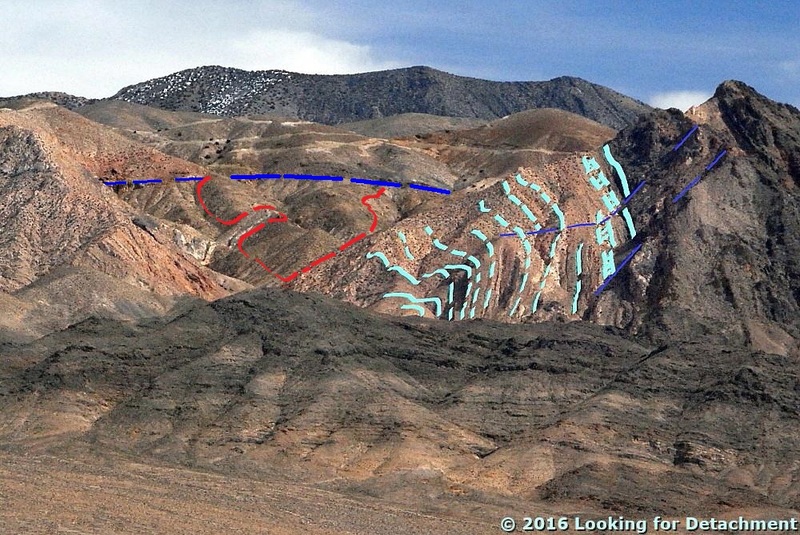 Oldow, J.S., Elias, E.A., Ferranti, Luigi, McClelland, W.C., and McIntosh, W.C., 2009, Late Miocene to Pliocene synextensional deposition in fault-bounded basins within the upper plate of the western Silver Peak–Lone Mountain extensional complex, west-central Nevada: Geological Soc. America Special Papers 447, p. 275-312. Oldow, J.S., Kohler, Gretchen, and Donelick, R.A., 1994, Late Cenozoic extensional transfer in the Walker Lane strike-slip belt, Nevada: Geology v. 22, no. 7, p. 637-640. 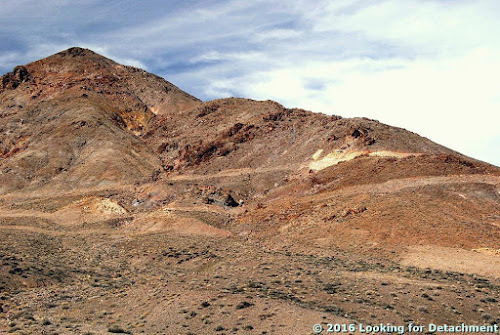 Strachan, D.G., 1988, Economic geology and exploration potential of the South Boss prospect, Boss gold mine, Esmeralda County, Nevada: unpublished report on file at Nevada Bur. Mines and Geology, 11 p. and notes. 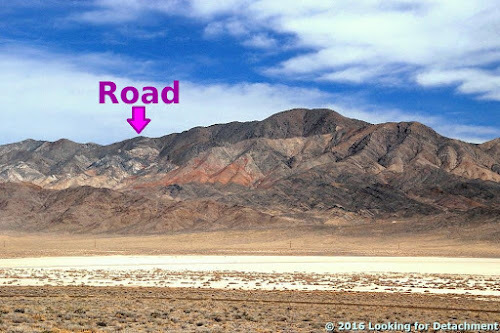 After lunch, MOH and I drove back into Mina and turned south on Highway 95, continuing our journey toward our next stop (shown above and way down below), and our more distant destinations of Beatty and Death Valley, . 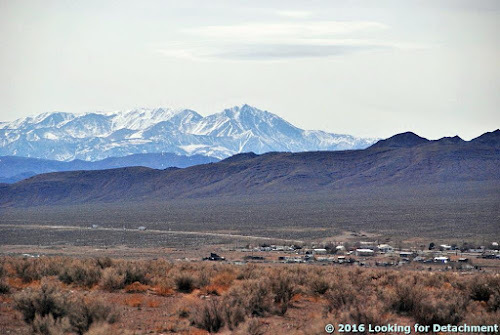 As a rule, I don't write much about U.S. Route 95—that preeminent north-south highway in the west ultimately connecting San Luis, Arizona with the Eastport, Idaho, border crossing into Canada—although I see that this is the 25th post tagged 95. 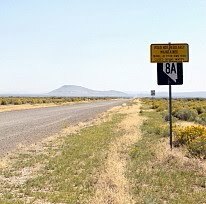 I personally have traveled over a good deal of this road, missing out only on the southernmost portion south of Yuma and most of the northernmost section north of Moscow, Idaho. Through Nevada, Highway 95 wanders around quite a bit, attaining a nearly north-south bearing only within four relatively short sections: 1) the Winnemucca to McDermitt section, 2) a section south of I-80, running from Trinity to Hawthorne, 3) the Tonopah to Lida Junction section, and 4) the section running from Boulder City to the California state line. 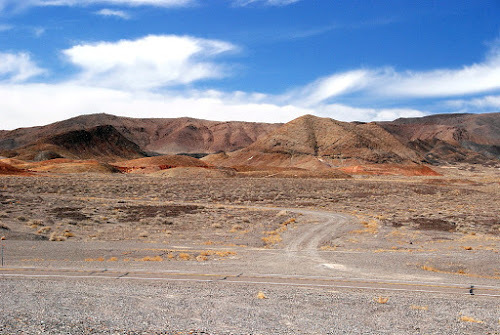 Much of 95's wanderings, especially those that occur between Hawthorne and Las Vegas, are caused by the highway's attempt to stay within the state while being subjected to Nevada's western diagonal border. To do that, the road keeps cutting east, then south, then east again, every now and then actually attaining near parallelism to the diagonal, while completing three major south-to-east curves. These curves are at Hawthorne, at Coaldale Junction, and at or just south of Beatty. From Hawthorne south, there are several opportunites for an unsuspecting traveler to veer from Highway 95 into California; a few of these occur at the three main south-to-east curves. 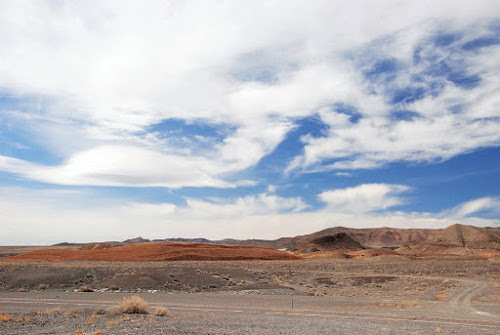 (I always think of 95 as though I'm headed south, not just because in this series of posts that's the direction we've been and will be going, but probably because I'm often eyeing it from a northerly position.) The first—and second—potential deviations into CA from Highway 95 occur in Hawthorne, a town now largely bypassed by most road warriors. At the main light (the only light? ), you can access both of these routes by driving south on paved S.R. 359. This road will take you south and then southwest into California, where it will become California S.R. 167. You'll end up on the north shore of Mono Lake south of Conway Summit. I don't think I've ever made this trip in either direction, but maybe, back in the way distant past... 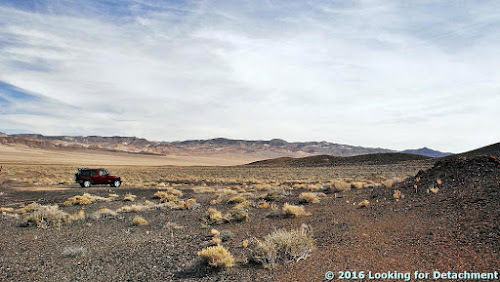 Prior to that, however, you have what I consider an even better opportunity to cut into California: Take the dirt road over the Wassuk Range into the Borealis mining area, past the Aurora turnoff, and then meander along the East Walker River north of Bodie to Nevada S.R. 338 and California S.R. 182, paved roads that will almost directly have you in Bridgeport, CA. At Coaldale Junction, Highway 95 joins U.S. Route 6, essentially coming to a T while making it's second grand curve to the east. 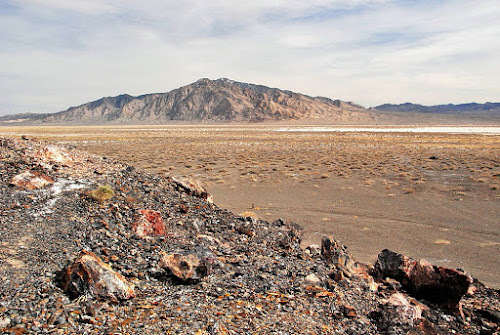 If you are persuaded to turn west, you might end up in Bishop, CA, by way of Basalt, Montgomery Pass, and the small berg of Benton. But before that, near a little jog at a place called Tonopah Junction, you might get suckered into heading into California at what is essentially a Y with S.R. 360, which cuts over to Route 6 at Basalt. 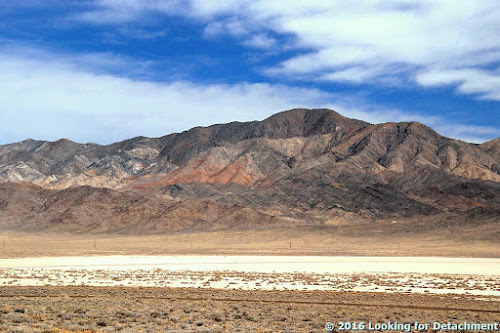 Beatty, just north of the third south-to-east bend in Highway 95, offers two alternatives for anyone wanting to leave the state before ending up having to drive through Vegas; both options require a sojourn into or through Death Valley. The most obvious of these escape routes is the paved Daylight Pass road, S.R. 374 in Nevada, which leaves Beatty at it's only stoplight. But before you make it to the stateline on this paved road, a one-way dirt road cuts straight west into Death Valley by way of Titus Canyon. We'll be taking that latter road later (ha! ), and we'll be visiting the Nevada-California stateline along Route 6 even later than that. MOH and I watched ourselves at Tonopah Junction, to make sure we didn't accidentally get sucked into California before we were ready. After ignoring said cutoff, we begin our ascent up to Redlich Summit. We passed the turnoff to the Candelaria mining district, and soon arrived at Redlich Summit, an apparently obscure summit with surprisingly poor location information on the web (see my location map for the actual location if you are interested). Redlich Summit lies just north of an old gold exploration project mapped and drilled by Former Mining Company in the late 1980s, which we always called just called "Redlich." A little bit of Redlich's geology and exploration history can be found here and here. In the second linked report, it would seem to me that the reporting geologist confused Former Mining Company for another exploration company with formerly similar initials. I had thought about stopping at Redlich to take a couple pictures for a story about the area, but we breezed on by in favor of looking for some ferrimolybdite, which as you might suspect from it's name, carries some molybdenum (Mo). I wasn't sure exactly where the collection spot was, but remembered it was at a color anomaly caused by hydrothermal alteration. We pulled off the highway just south of the main hill at the old Redlich property. Some drill roads at Redlich, on the south side of the hill sometimes known as Conglomerate Hill (also seen in the first photo). The canary yellow ferrimolybdite that I remembered from some field trip back in the late 70s or early 80s, maybe the same one I had learned about plating copper from what looks like plain-ole Mn-oxide while working for Northern Exploration Company, had been easy to find along a dirt road just west of the highway. I could tell without spending much time that this first pullout wasn't the spot, but we looked around a bit anyway. The view from south of Redlich, looking SE toward the Monte Cristo Range. A somewhat weak desert pavement had formed in the area. While walking up the drainage looking for ferrimolybdite, I spotted this nice specimen of a cholla. It's probable that the ferrimolybdite site noted for the Red Hill area (sometimes conflated with the Redlich mine, as in this Mindat list), is about 2 miles south of where we pulled out. We missed the turn, somehow, and instead pulled out at the historic marker for Columbus, an old borax mining town located to the west along the edge of the Columbus Salt Marsh. Historic marker #20 can be read here. 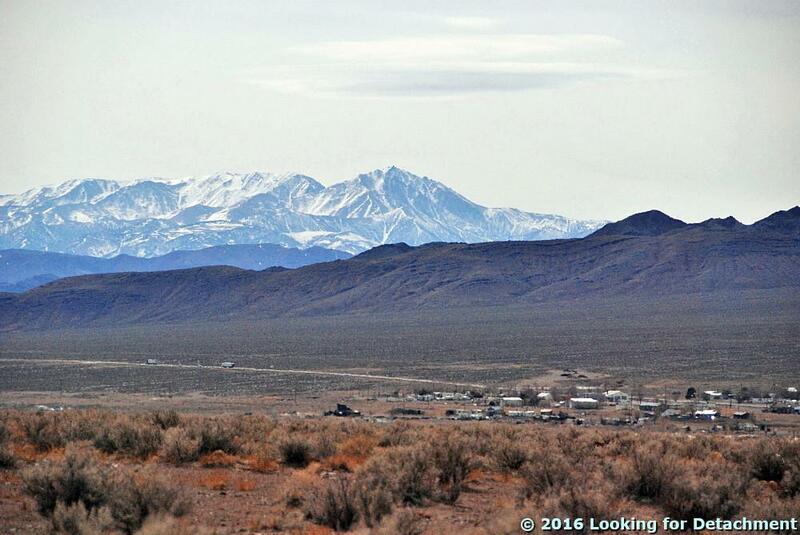 Boundary Peak in the White Mountains is out there beyond the salt flat. The north end of the White Mountains. 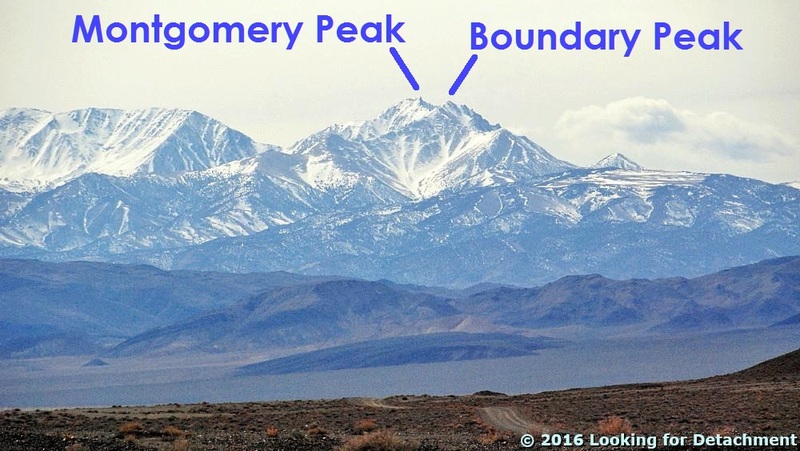 Montgomery Peak (13,441 ft or 4097 m) is a mere blip of a hill in California; Boundary Peak (13,140 feet or 4005 m) is the highest point in Nevada. We turned back south, drove by Coaldale and made the second big south-to-east curve toward Tonopah and beyond. An unnamed portion of the Gabbs Valley Range. From the vantage point of the end of the last post, a little southwest of Luning, Nevada, I turned around and pointed my camera northeast across Soda Spring Valley ... and paused to think back to the late 1980s, when we in the Western District of Former Mining Company had finally taken over exploration of the Walker Lane, which until then had been a mostly unexplored part of the Nevada District. We drove all the roads in the area—up canyons, over ridges, and across saddles—and one thing I remember in particular was coming over the top of a low ridgeline from the east, on a jeep trail that dived and went into a series of moderately sharp switchbacks as it approached some old mine workings. The road in question is below the arrow. Ah yes, the memories. We found a gold-bearing skarn—it's not quite in view in the photo above—and after some sampling and sketch mapping, we debated targeting some drill holes, but decided it was too small for our target size. Back to the road itself. Coming over the top from the east (something I'm not likely to do in any near future that I am aware of), the road immediately drops and dives around a curve, making it hard to judge the condition of the road ahead. We maneuvered to some particular point and stopped. What the H! We would have to do a bunch of walking to actually explore the area anyway, so maybe it would be better to stop here at this turn-around spot than to go farther and find that the road requires backing up on steep slopes around sharp turns. I don't really remember how we handled the sampling logistics. Sometimes it's easiest to drop a couple people off near the top and then meet them at the bottom later in the day, after they've sampled the upper slopes and you've sampled the prospects in the lower hills. Or maybe after a bit of walking around, we found the road acceptable and drove on down. The road as seen in Google Earth. It's downhill to the lower left (SW). The Google Earth view of the road is somewhat impressive *in* Google Earth; here's the Google Maps link in case you want to find it on Google Earth. Walker Lake is off in the upper right (W), Luning is just left of center on the other side of the beige plain (SW); Mina is out of the picture to the left (S). After grabbing the first shot or two, I pointed my camera more to the east—a little north of east, to be precise—at a folded part of the Gabbs Valley Range, another area we explored back in the late 1980s. The notable landmark of this part of the Gabbs Valley Range is a dark pimple of a peak to the right of center: Volcano Peak. 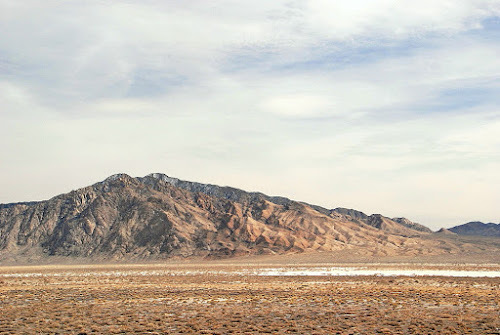 Volcano Peak is not a volcano; rather, it is underlain by tilted beds of the Upper Triassic Luning Formation, which consists mostly of limestone, dolomite, and shale. Zooming in, we get a better view of Volcano Peak and can identify a few old porphyry copper drill roads that probably date back to the 1960s or 70s. In a similar Google Earth view, we can begin to see a fold nose, centered and just above the dark line (a Google Earth artifact). I've cropped this image so I could zoom in farther. The upper drill roads are more apparent. Volcano Peak is now on the far right. It can be fun to take a shot at the geology by drawing lines on photos like these, or on air photos. 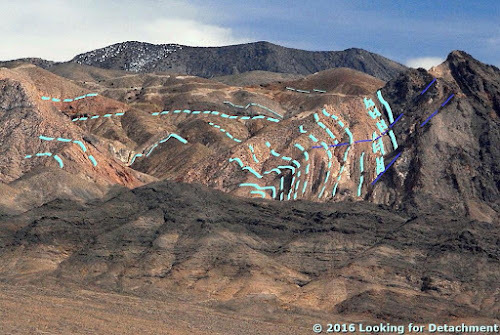 Drawing without checking the geology first can be chancy, if one is concerned about being right, as can drawing without checking the geology in the field afterward. Before checking the geology, I came up with the following cartoon, wherein I assumed many features to be stratigraphic beds, and assigned a few other features to faulting. Here's my first cartoon, with presumed bedding in cyan and a few tentative high-angle faults in dark purplish blue. I wondered if the central dashed line across the first cartoon was a low-angle fault of some kind. After concocting the first cartoon, I checked out the geology as mapped by Ekren and Byers in 1985. It turns out that I missed a large blob of quartz monzonite (mapped as JKqm). 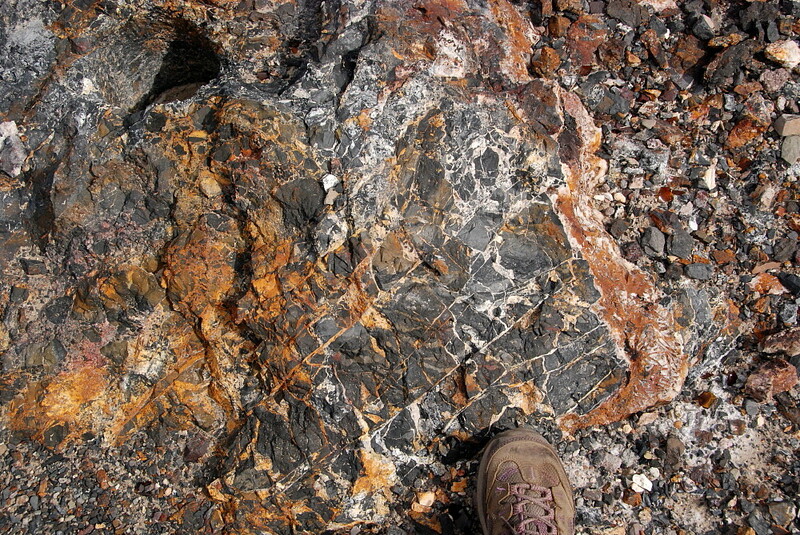 The quartz monzonite is outlined in red. The central line, which was dashed in cyan in the first cartoon, has now been drawn in dark blue, a mapped fault. It's a high-angle fault, however, and it's just our angle of viewing that makes it look horizontal. (Here we can see why apparent dip matters so much: from this angle, the dip looks to be nearly zero; in reality, it is closer to 90 degrees, although that's a guess, as there is no measurement of it on the geologic map.) The quartz monzonite is cut by this high-angle fault, which is down-to-the east, dipping eastward away from us. I left in the cyan bedding emphasizing the fold, and I left in my still tentative high-angle faults in dark purplish blue (toward the right). These two cartoons show the problem with assuming too much from photos (or air photos). 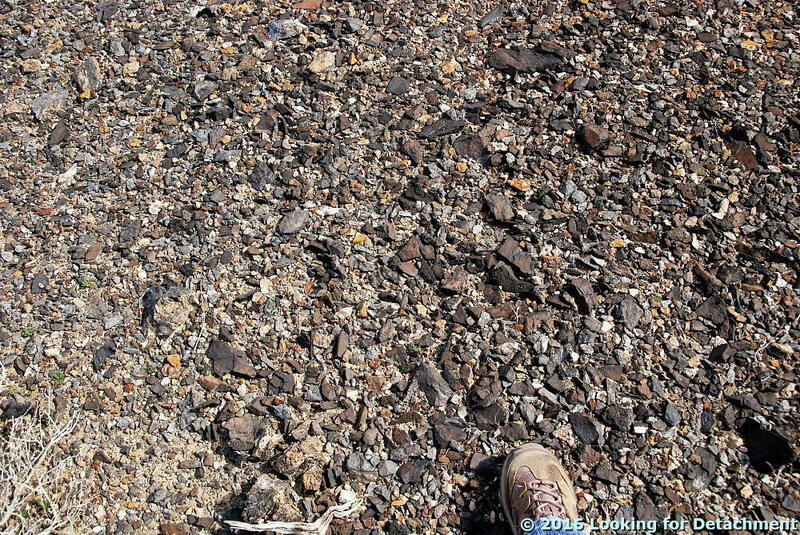 Features that look like bedding might, when field checked, actually be faults, dikes, or other structures like joints. In this when case, we checked the cartoon against a geologic map of relatively small scale, 1:48,000 or 1 inch = 4000 feet. 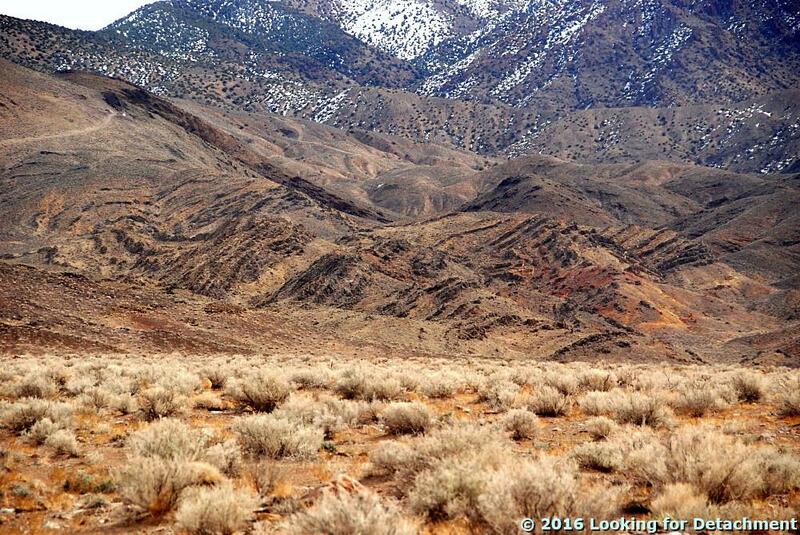 Somewhere in these canyons, way back in the late 1980s, we came across an old, partly broken-down core shed. The shed was mostly intact then, but the core had started to become scattered, either from vandalism or from the escalating disintegration of the core boxes (or both). 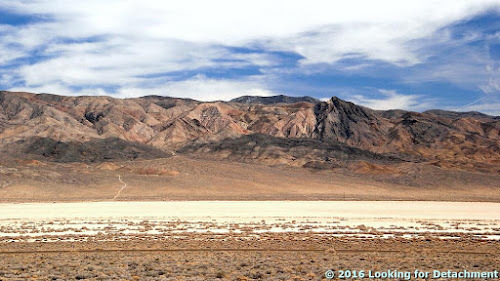 By this time on our trip to Death Valley, it seemed that we should be farther along, but we hadn't even gotten to Tonopah! So we moved on, but almost immediately we decided to stop not far down the road: it was getting to be lunchtime. Just before Mina, we pulled off the highway onto a major dirt road that goes eastward between the Gabbs Valley Range and the Pilot Mountains. Looking southeast toward the Pilot Mountains from a broad alluvial plain above the town of Mina. 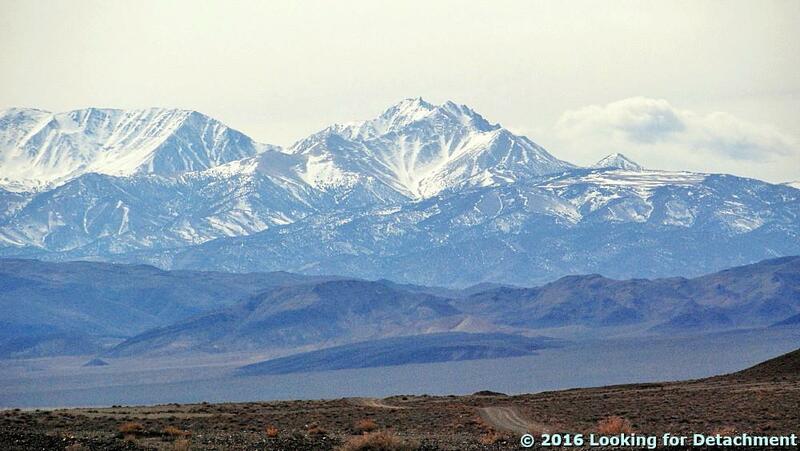 Pilot Peak is hidden from view behind the unnamed, lightly snow-dusted, >8500-foot-high peak. A lot of folding, thrusting, and possibly some low-angle normal faulting has occurred in the Pilot Mountains. In fact, the area is (or should be) one of the type localities for the Luning-Fencemaker fold-and-thrust belt. While eating a cheese-bologna sandwich, I took a few photos of some of the folds. Some recumbent folds are actually better viewed from another road, but I forgot about that until looking around in Google Earth. Folds! 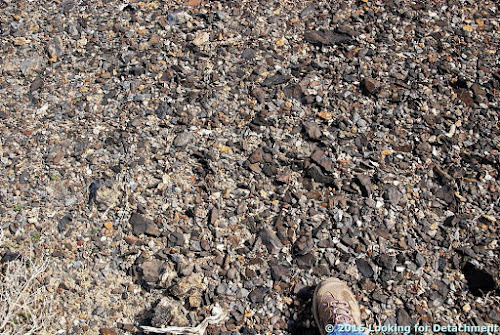 This is probably mostly Luning Formation limestone and shale, with some Tertiary volcanic rock in the lower left. The potential here for great fold photos only increases with time spent in the area, and driving up into the hills would do the same. I turned away from the folds to take this shot of Boundary Peak. I grabbed this photo of Boundary Peak, hoping that MOH and I would get even closer later in the trip (and we did!). 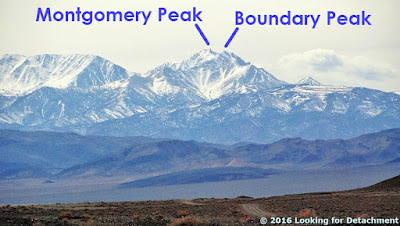 The photo shows both Boundary Peak (the highest peak in Nevada) and the higher Montgomery Peak, which is right behind it and slightly to the right in this photo—look carefully! We'll continue our journey after lunch. We'll be stopping at Redlich and the Boss Mine. 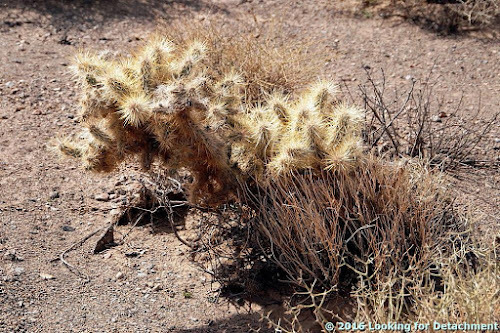 We'll see desert pavement and a cholla. 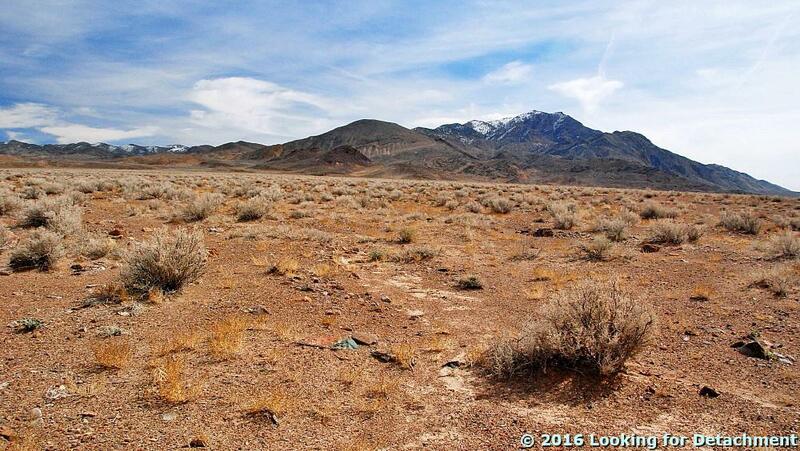 We'll see Boundary Peak again. We might spy some breccia and a solar power plant.